It seems food guilt is everywhere these days. Every month there is a new article meant to scare people about the dangers of various foods. You thought soy was good for you, wrong, same goes for eggs, butter, and almond flour. Then 6 months later the opposite. Oh wait, eggs aren't as bad as we thought, maybe agave syrup isn't as great as we stated 6 months earlier. Honestly, we all need to calm down a little. It seems that a constant state of panic is what many people thrive on today. Food companies and various interest groups have picked up on this panic and made millions of claims. We all want to live longer, but if you are constantly worrying about the foods that you eat your stress level will be higher, which is not a good thing. For me personally, I eat a small amount of everything. Over the years I have been a vegetarian, a vegan, and an anorexic. I gave into the hype in my 20's and my relationship with food was horrible. I spent so much time obsessing about what I should or should not eat that I didn't each much of anything. Currently I have a great relationship with food. I am thin, in great shape, and my cholesterol levels are as low as non-meat eaters. Most of all I don't limit any foods, I just don't overdo any of them either. I do have one piece of cake, not three, but the one piece of cake that I do have I enjoy every moment that I'm eating it. Food should be enjoyed, not obsessed over. None of us remembers the food we didn't eat, but almost all of us remember at least one great food memory. Almond flour has had a bit of a controversy in the last 10 years. Some people love it, others have a list of reasons why it should be avoided. I'm not going to list either side here. I use it occasionally. If I buy a bag for a recipe I experiment with the remainder of the bag in baked goods. The texture is different than other gluten free flours and it can be a bit expensive, but you can make your own almond meal (flour) in a food processor and most recipes take less than a cup. My advice with anything gluten free is to try all the options and then pick the one that works best for you. None of us are the same and neither should our food choices. 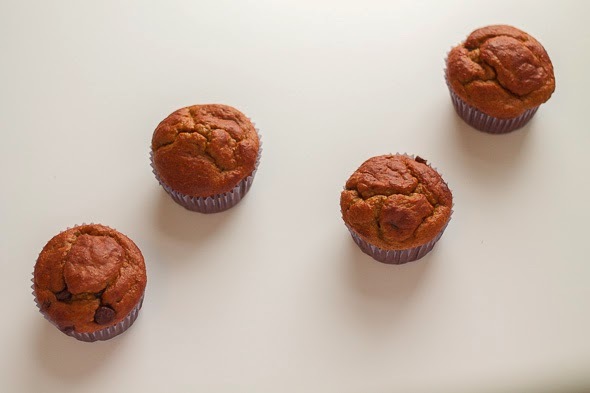 With that said, the following is a recipe for Almond Flour Banana Bread/Muffins. Recipe adapted from Jan's Sushi Bar. Combine the almond flour, salt, and baking powder in a bowl. In a separate bowl combine the eggs, butter, sugar, and vanilla. Pour into a 9 X 5 inch greased loaf pan. Bake in a preheated 350 degree oven for 50-60 minutes. Tent the top of the loaf during the last 15 minutes of baking if needed. You can add chocolate chips or walnuts if desired. 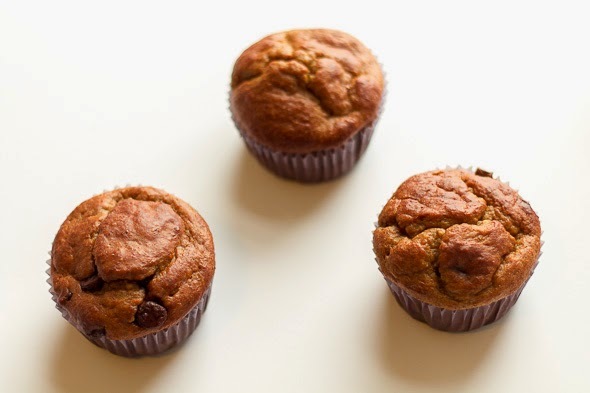 This recipe can also be made as muffins (as seen in my pictures above). Just make sure to decrease the baking time to 15-20 minutes of total time. 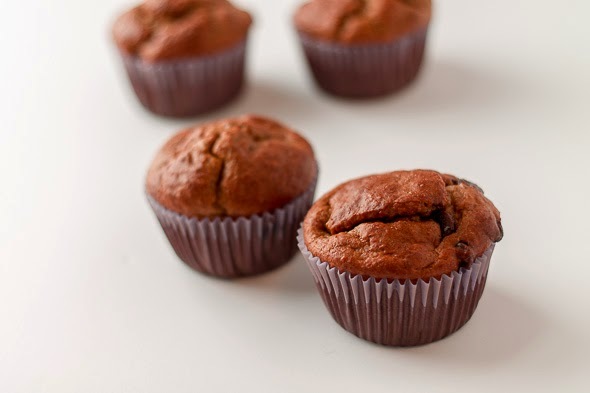 Also muffin liners are best since the almond flour tends to stick a little without a liner. If you don't eat butter, coconut oil can be used as a replacement. The same goes for the granulated sugar, date or coconut sugar would also work. As with all bread recipes check the loaf after it has cooked for approximately 40 minutes. Tent the top with foil if it starts to over brown and check the middle of the loaf for doneness before taking out of the oven. The total cooking time can vary greatly based on a number of factors so don't be alarmed if your bread takes longer than the total stated time.